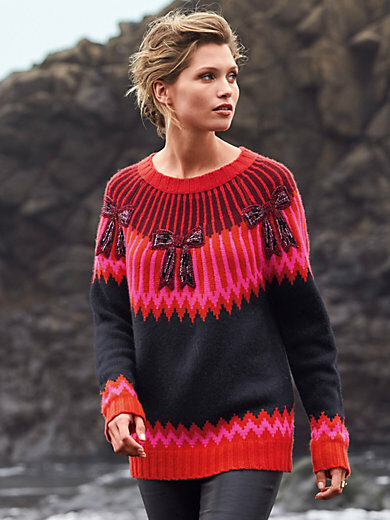 Round neck jumper by ZAUBERMASCHE: a fabulous knitted work of art featuring a special pattern in Norwegian style and pretty colours. Appliquéd bow motifs with beads on the front. Certainly not one to be overlooked. Wonderfully soft made of 6-ply premium yarn made of pure new wool and cashmere. Slightly longer style with raglan sleeves and ribbed cuffs and hem. 70% new milled wool, 30% cashmere. Length approx. 26ins. The round neck jumper should be washed by hand.